Miracle Merchant ($1.99) by Arnold Rauers is a solitaire style potion brewing card game that will delight everyone. 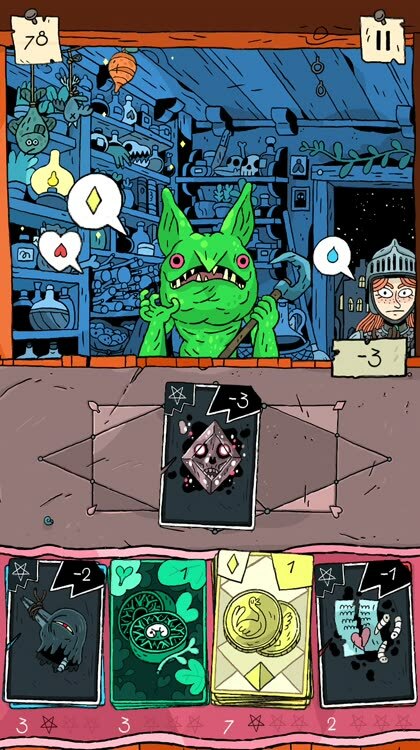 If you couldn’t get enough of Card Crawl or Card Thief, then you will love Miracle Merchant. In the past few years, it’s become harder for me to find developers who continue to release quality games that I will purchase without hesitation. Fortunately, Rauers is one of those developers who releases top notch card games, and I must admit that they’re rather addictive. I grew up playing card games of all kinds, so I have a soft spot for them. When Rauers first released Card Crawl, I knew it was something special. Then Card Thief came along, and I added that to my collection. And now we have Miracle Merchant, which is possibly my new favorite. 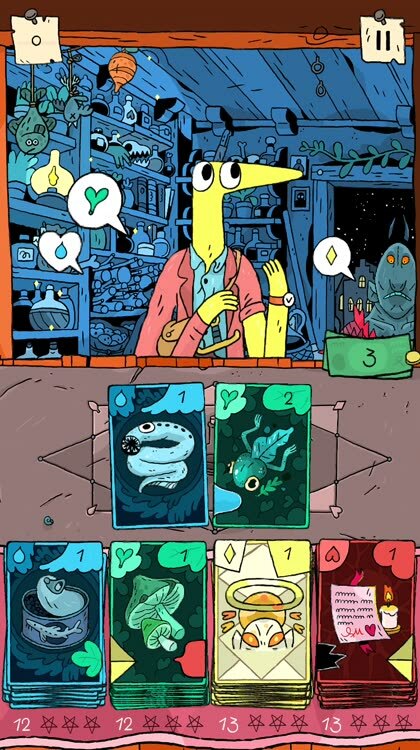 Visually, Miracle Merchant falls in line with Rauers’ previous games and has the scrawny, hand-drawn cartoon art style. It always reminds me of cartoons like “Adventure Time” and “Regular Show,” which isn’t a bad thing in my opinion. The colors are bright and vivid, though you have some darker and more morbid ingredient cards too. Animations are smooth and fluid, with no lag on my iPhone 7. The game also has a soothing ambient soundtrack that is delightful to listen to, as well as some great card shuffling sound effects. Once again, Rauers has another fantastic hit on his hands. In Miracle Merchant, there’s only one game mode, but that’s all you need. There’s also no extras, such as shops or upgrades, so all of the focus is on the gameplay itself. The gist of Miracle Merchant is that you are the owner of a potion shop, and you have to fulfill customer orders by combining ingredient cards. There are a ton of different potions to discover and create, with the results always dependent on the order in which you lay out the ingredients themselves. Each round consists of you filling orders until you’ve cleared out the ingredient cards (you win) or you fail to get an order correct (you lose). so how do you play Miracle Merchant? Along the bottom will be four stacks of cards, which represent colored ingredients. Customers come in with a required ingredient color (top speech bubble), and then tell you their favorite ingredient color (bottom speech bubble). To create a potion, you need to include at least the required ingredient, their favorite for a bonus, and then two more, as all potions need four ingredients to make. However, there’s more to Miracle Merchant than meets the eye. On each card, you may see another color in the bottom corners, or even in the center. If it’s in the corners, you get a bonus if you place that indicated color next to that card on the specified side. When it’s along the bottom, that means you get the bonus as long as that color’s included in the combination. In addition to the colored ingredients, there are evil ones too, which are black cards that may appear in any of the ingredient card stacks. Fortunately, some customers want these sketchy ingredients in their potions, and it’s easy to spot because of the black speech bubble with the star in it. Each card features a number in the top corner as well. This number represents the value that the ingredient is worth. For a potion to be viable, it needs a value of at least one in order to count — anything less and it’s considered too weak. Customers won’t take these weak potions, thus ending the game. You’ll have to be careful with the evil ingredients though, because they have negative values, so balance it out with other high value ingredients. Having two like-colored ingredients next to each other nets you a “twin” bonus, so keep that in mind. If there’s a customer that comes in and you are unable to fulfill their order because the ingredients aren’t available, then use the “boot” button to move them to the end of the line. This is helpful when all stacks have evil ingredients and you’re not able to guarantee the right ingredients for an order. To keep things interesting and have a high replay value, there are missions for players to complete, in addition to trying to win games. These may include things like “Create a yellow duplex potion,” “Win five games,” and more. They’re rather hard to accomplish and take some time to complete (you need to win a round for them to clear and get new ones), so it just keeps you coming back for more. 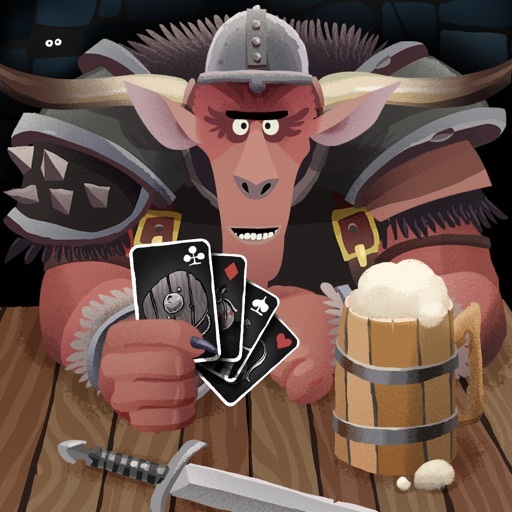 The makers of Card Thief and Card Crawl have a new card based challenge for you to play. 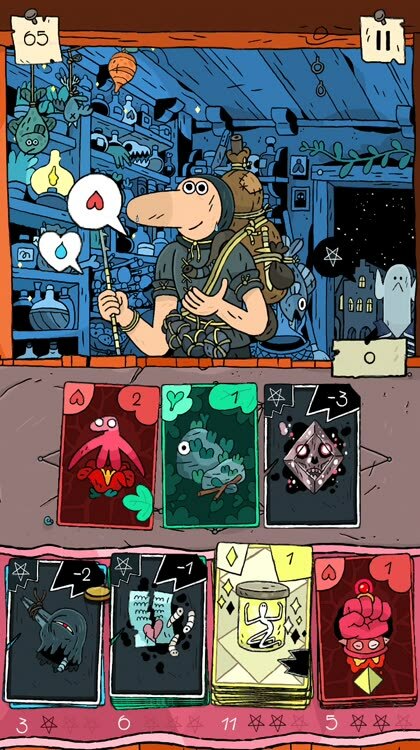 Miracle Merchant is definitely another mobile card game hit from Rauers. If you’re a fan of the other two games, then this one delivers more of that addictive card game challenge in a unique visual style. The rules are simple to learn but it takes a lot of planning and strategizing in order to win. It’s a challenging game with high replay value because of that. Just like the other two games, winning in Miracle Merchant is not an easy task. Since the goal is to fulfill all orders while clearing out all of the cards, it requires planning ahead to succeed. This is not the type of game for those who just want to win all the time, and it even requires some patience until your first win. As a big fan of Rauers’ other two card games, I am in love with what Miracle Merchant has to offer. The game shows off the distinctive visual style of the developer, and the sound design is well done. The tutorial explains all of the basics to you in a simple-to-understand manner, but the gameplay itself is challenging and requires some thought. There’s a ton of possible combinations of potions to discover and serve, and the goals keep everything fresh. 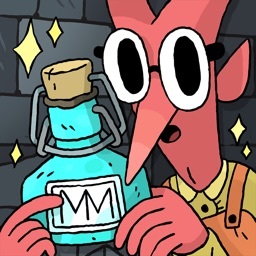 I’ve just started playing Miracle Merchant since it was released last night, but I’m having a hard time putting it down. It’s just that good. 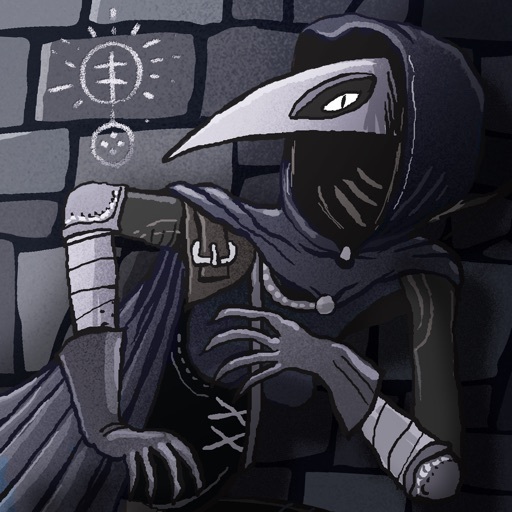 I highly recommend grabbing Miracle Merchant if you’re a fan of Card Crawl, Card Thief, or just want some unique solitaire-style card game fun on your iOS device. 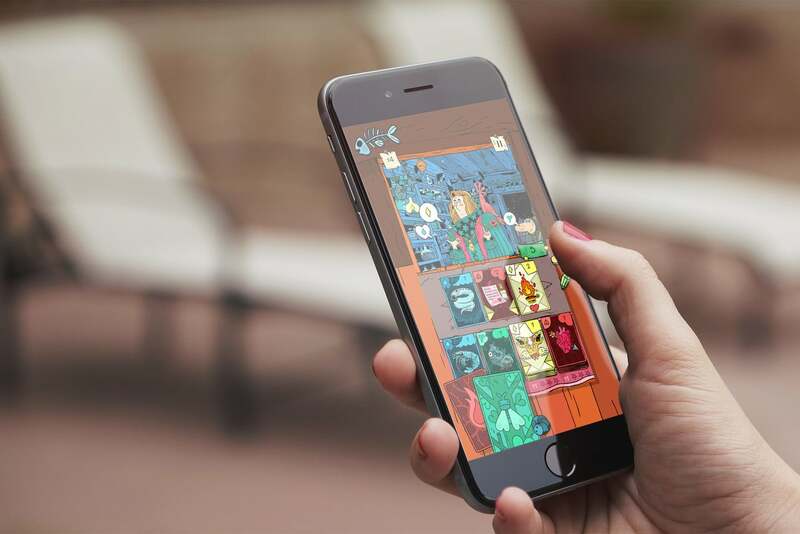 Miracle Merchant is available on the App Store as a universal download for your iPhone and iPad for $1.99. There are no in-app purchases.